Sometimes its like dancing, sometimes skiing, occasionally its even like driving. 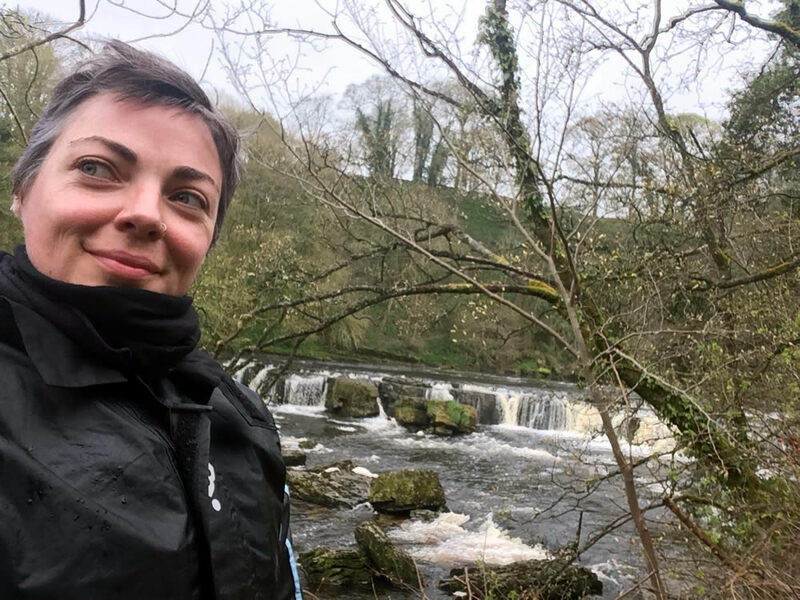 5 days biking through British countryside. As commuters scattered through a drizzly Dublin early one Friday morning, I threw a tightly packed dry bag into my back-box, donned my helmet, engaged the choke, hit the starter and away from the hustle we hummed. Me and my trustee Honda CB500 Spencer that is. Together we have enjoyed many a journey, but never in pack formation, for days on end, touring. So this morning was the highly anticipated dawn of new ventures to come! 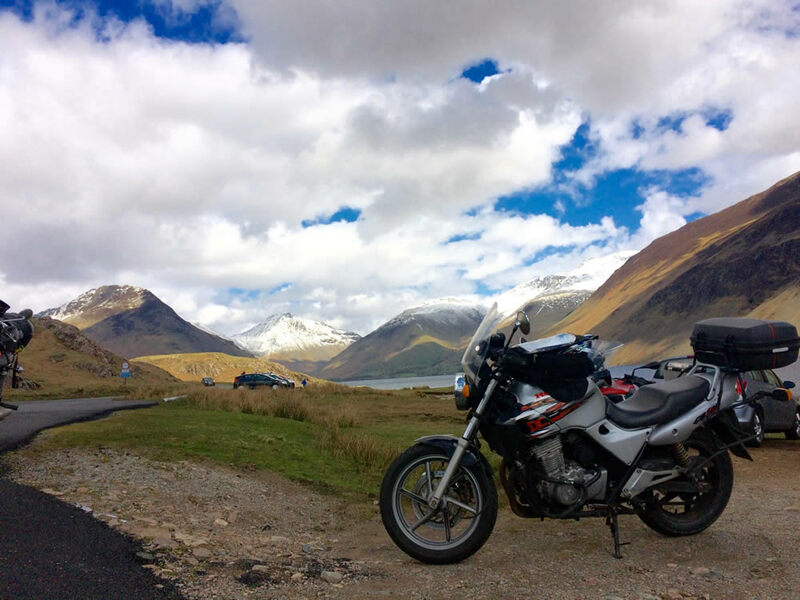 We would join a pack of 10 Dublin based bikers for one extended weekend of motorbike riding adventures in Great Britain. At a few minutes to nine we rolled into the station and saw some laden bikes. Confident we found the correct meeting place and there was no turning back now, I parked up and beamed expectantly at anyone standing near a motorcycle. Ignoring the fact we are wearing several layers of thermals making us overdressed to stay within the station comfortably, we sat in its shelter and sweated over a coffee, eagerly discussing the road ahead. 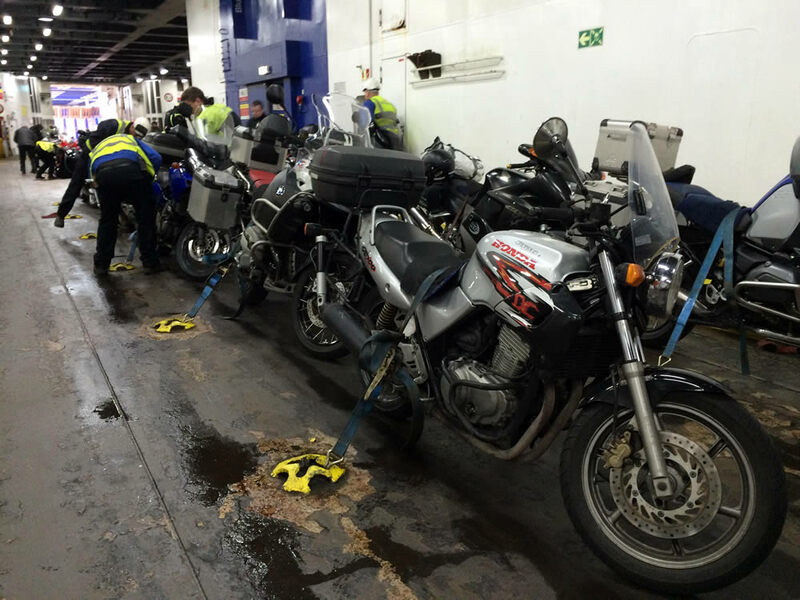 We would leave Dublin, heading straight to the ferry at Belfast and sail over to Cairnryan in Scotland, where two friends of one our pack would meet us. These friends, Andy and Mark, are super experienced riders who have toured various parts of the world together, they know their country and will take us on a 5 day journey through spectacular countryside in Scotland, England and Wales. 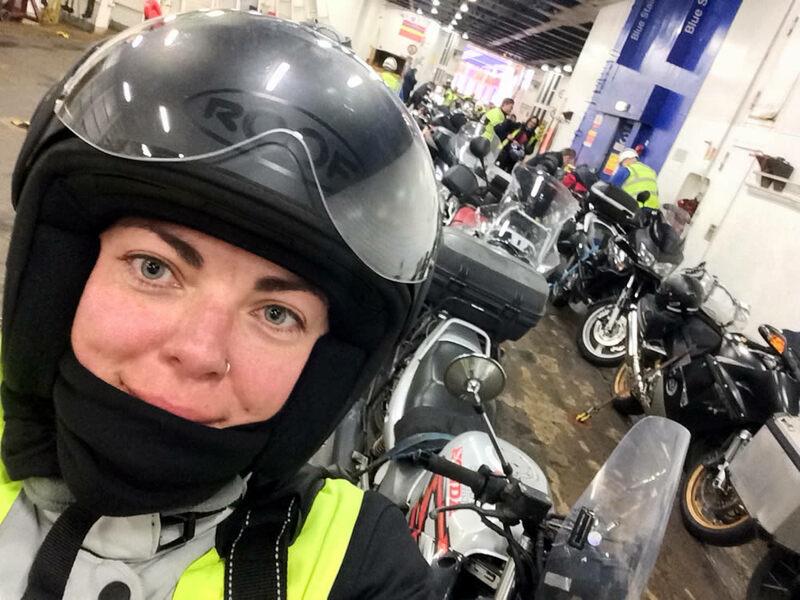 We were a pack of 10 comprising 5 European nationalities pulling out of the station, riding against the wind and traffic in formation up through the North of Ireland and on to Belfast, where we met the ferry in good time. On arrival I tried not to act too inexperienced, but seriously, I had no idea how the whole bike-ferry thing was going to work out. I eagerly watched experienced drivers ahead gingerly navigate damp shiny steel under-tyre toward some ratchets straps and squares of protective carpet, all laid out for our bikes. At lunchtime the ferry docked. Andy and Mark greeted us, hopped on their new BMW 1200GS and away up through bends and twists of Galloway Forest Park in South Scotland we tore. Up and up and on and on after Andy and Mark, this was going to be a fast paced trip. Would my 17 year old CB be able to keep up with brand new GS on roads like these? I soon discovered the answer is… yes! We funneled through idyllic landscapes, just awakening from winter, blossoming daffodils footed rounded drystone walls, sheep idly grazed by the roadside, last nights snow still clung to fir dappled hills and grey clouds reflected in the many lakes. As the day progressed to evening, those grey clouds were growing darker and threatened heavy downpours to all sides but the direction we were headed, so we amped the throttle and focused on this evenings destination. Successfully avoiding the rain, we stopped the first night in Penrith, England, for dinner, a few beers and a couple of hours sleep. 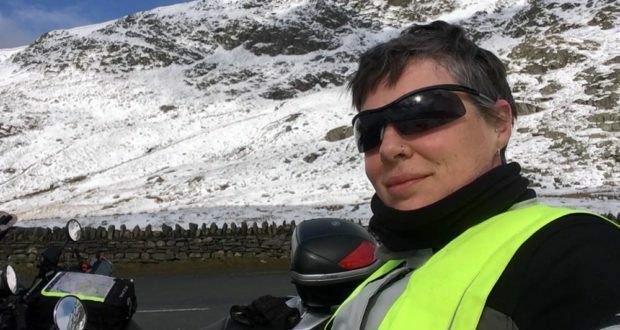 Early morning fidgeting with a new helmet on take off meant I was to the back of the pack on day two, but Lord-God was I thankful of that when we hit the Lake district. Driving SW from Penrith into The Lake District Park, I really had to work hard on reminding myself to look at the road. Idling to the back with no pressure to hare along and do my bit to keep the group together, I took the liberty of personifying a Sunday driver, easily distracted by sheer peeks dramatically punctuating clear lakes. Docile roads flanked with packed drystone walls and exposed-stone houses displaying the varied geology of the area, gave me plenty to ponder over. As a geologist, I was in delight trying to work out the story detailing the evolution of this beautiful area, from clues in the landscape and the stone walls that give this region its character. Then, I got stuck behind really slow drivers and became even happier, elevation increased and we began snaking through white snow covered mountains, in awe of their beauty. The air was crisp and cold for early May, but I could have drove on that road forever. Andy and Mark however, waiting ahead with the pack, had different ideas! We were going to earn lunch, we were going to ride mountain passes, which incorporated the most interesting blend of distracting scenery, road subsidence, random camber, sharp incline/decline angles and sharper hairpins, punctuated with chicanery. I watched the GS gang in jealousy as they stood on pegs, read oncoming bends on GPS and adjusted modern manual comfort settings. Would my gadget-less bike be able for this terrain? Again, the answer is… yes! On successful completion of Hardknott Pass, the brave and triumphant pack joined at Hardknott Roman Fort, a site dating back to 120AD. After that ride it is hard to imagine how horses laden with carts and weight managed to deliver supplies to the cohort of 500 that would have manned this station. Hours of scenic driving later we took a photo stop at Scafell Pike, the tallest mountain in England. From here we took advantage of England’s well maintained road surfaces and enjoyed many a bend until Hawes, where we had booked pod camping accommodation in the wilderness of Wensleydale. Day 3 and the mornings mist hung over Hawes, England’s highest market town. This did not deter us from our characteristic early start, but what delights would be in store for us today? The rolling Yorkshire Dales! With limestone outcropping hills adorned by cascading waterfalls. I often think, to motorbike through a countryside is to experience it, you feel the road, sense the air, smell the manure! Tranquil villages and towns were separated by glens and moors. We took a rare photo stop by the Ribblehead Viaduct, underneath which lies ancient monumental land. Zipping up the road after Andy, we were cornering so fast I repeatedly apologised, in my head, to all of the English people I have ever known. After a luxury nights rest in the welcoming Wolly Sheep, Skipton, our bikes were mounted with gusto. Driving like we were late for mass, we took the road South to and through the Peak District National Park. Soaring snowy peaks took us into the clouds, showed us how spectacular rainbows can be, and tested our waterproofs. 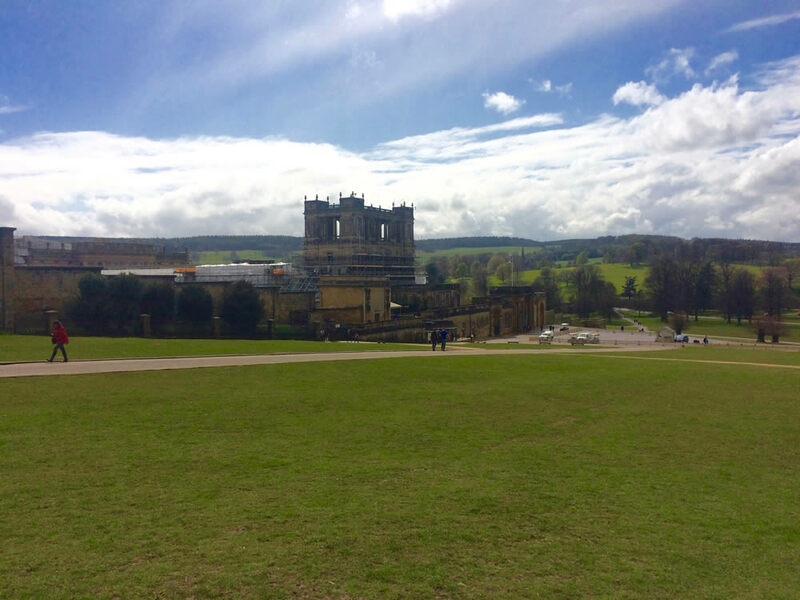 A rather fine lunch in the ostentatious Chatsworth house gave us ample opportunity to warm up and refuel our energy before we got back to business. I drove directly behind experience; watching, learning, interpreting, adjusting and thinking; this is a careful balance, a series of fast fluid reactions, sometimes synchronised, kind of like dancing. This is flying downhill, cutting through corners with the perfect synergy of agility, speed, grace and arc, kind of like skiing. This is gear selection combined with clutch control and correct throttling that match each oncoming eventuality with precision, this is also kind of like driving. Whatever it is, I love it! We move onward at a pace indicative of those who have reached their limit of saturation, on toward the well-known resort of Alton, where our host for the night had won all of the teddies that stuff the most fascinating Inn we had the fortune to prebook. It was the last night and it did not disappoint; our accommodation just outside Cheadel and our host Margaret are full of character. Plenty a ghost story was implied over dinner and a few pints in the 500 year old tavern and roars of laughter filled the night. Day 5 and sadly we waved goodbye to Andy and Mark, they took their respective roads home, while we turned our attention onto Wales. Tim took the lead, fair warning had been issued that Tim is likely to “take you through every grassy backroad and boreen he can find”. We weren’t to be disappointed. At times I wondered if 10 bikes would wind up in a bewildered farmers yard? Or would we perhaps land at a gate that would have to be opened in order for us all to turn back? Alas, Tim knew exactly what he was doing, taking us on the scenic route back through Wales and on to our ferry at Holyhead, before we sailed to Dublin. 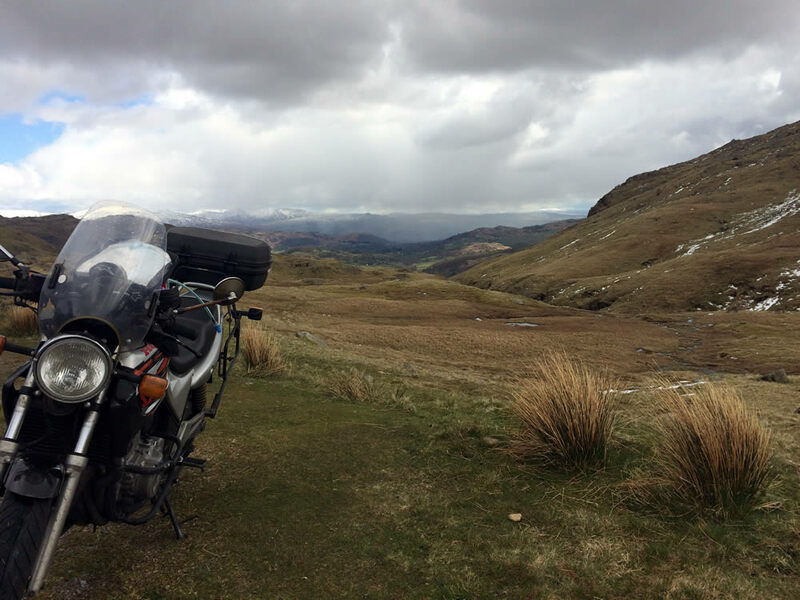 The famous Horseshoe pass and Snowdonia National Park were both a real treat! Lunch in Menai Bridge was a sobering affair; soon we would take the final stretch of motorway to meet the ferry. In no time we were on the ferry in a peaceful happy lull, responsibility was close at hand again. We smiled, nodded, hugged, hopped on bikes, gingerly navigated the damp shiny steel under tire and off we dispersed like dendritic shoots off a river of shared experience. I pulled up outside my home, so extremely grateful to our guides, our groups coordinator Tom and everyone I had the pleasure to ride and laugh with, my sincerest gratitude to you all! Next: Toronto Motorcycle Towing $50 – Towing Tuesdays!